Click here to watch a video from the Big M Tobacco warehouse by Wilson Times journalist Drew C. Wilson. Jim Barnes, a forklift driver for Big M Tobacco Inc., hauls a bale of tobacco around the warehouse on Goldsboro Street Wednesday. Jim Barnes, a forklift driver for Big M Tobacco Inc., right, shares a moment with fellow drivers Curt Harris, left, and Jackie Dawson, middle, at the warehouse on Goldsboro Street this week. Jim Barnes, a forklift driver for Big M Tobacco Inc., looks down the line as he places a bale of tobacco in the warehouse on Goldsboro Street this week. Samuel Joyner, right, of Wilson, stands by at right as a forklift carrying tobacco moves by at the Big M Tobacco warehouse in Wilson Thursday. Jim Barnes is known to spin his wheels a time or two. 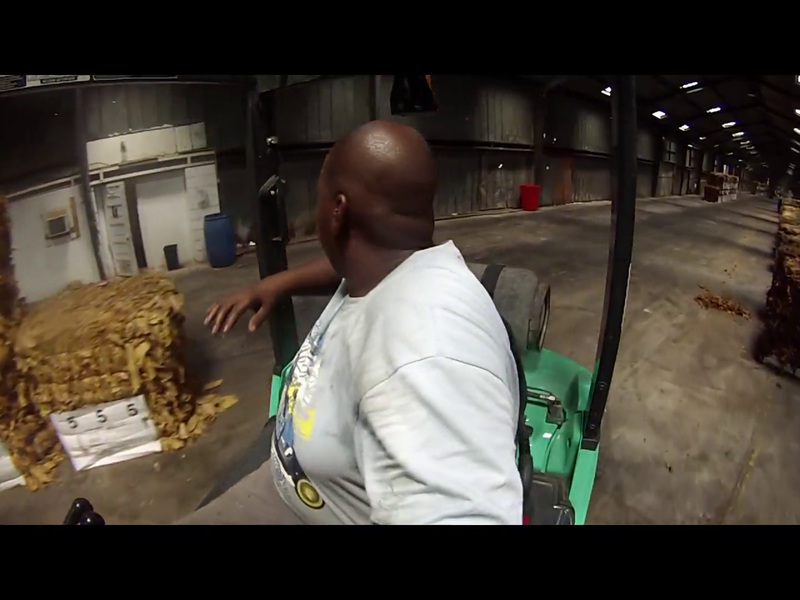 On the floor of the Big M Tobacco warehouse in Wilson, Barnes negotiates his Nissan forklift in between long rows of tobacco bales. He moves fast, but he's always careful. "I've been driving 12 years," he said. For Barnes and the other drivers on the floor of the cavernous warehouse, 16 mph is top speed. But there are many obstacles. "You've got to look out for people. You've got to take your time," Barnes said. "You've got to be cautious. You've got to turn your neck. You can't be stiff-necked. That's how it is." Barnes has never had a wreck, although he admits to lightly bumping into a stanchion. "I have hit one or two," Barnes said. "If you bump it too hard, it will move, and we don't want the whole building to fall in. You know what I'm saying?" Barnes, 40, lives right down the street from the Big M warehouse - the old Liberty Warehouse at the corner of Ward Boulevard and Goldsboro Street. He got his heavy equipment operator certification from Wilson Community College. The Wilson native is among the workers who take notice when the tobacco market begins in Wilson. "When they opened the doors and I found out they are going to start moving tobacco, I came in here and asked if I could get the position for a forklift driver," Barnes said. "He hired me on the spot, and I'm in here now." Moving a 788-pound bale of compacted leaf takes finesse. "If the tobacco is really fluffy, you've got to take it easy," Barnes said. "If it's hard, you can roll with it, turning it over, mashing the gas and making it go." For the last five seasons Barnes has been working together with Jackie Dawson of Whiteville. "He's the grand master," said driver Curt Harris of Wilson. Dawson, 50, been driving a forklift ever since he was 18. "I've been on tobacco most of that time too," Dawson said. "I've been working several warehouses. They call me back up every year. I'm a 'bacca man. I'll always be a 'bacca man. They say why don't you do something else. I've been in 'bacca all my life. I ain't gonna get out of it." Like Barnes, Dawson said he has bumped a stanchion just slightly. "I ain't gonna tell you no lie now. A post has been hit. I have tapped one in here," Dawson said, adding they get in a rush sometimes. "We have 'bacca here, 'bacca here, 'bacca there. You gotta go, go, go." Tommy Swan, a manager at the Big M, said watching the drivers is amazing. "For me to think about doing what they do would be scary," Swan said. "They know that they're doing. They see you more than you see them. They have to meet training requirements in order to be able to operate forklifts. "When you've got a lot of tobacco moving and you've got five forklifts going, you have to have people who know what they are doing. They work like a team. They know what a forklift is capable of doing. And they know if they don't work together, it makes work harder for each of them." When they are moving tobacco, it is a chorus of whining engines, squealing wheels and, of course, beeps and honks. "We're on the safety side. We don't want to hit nobody, and we don't want to hurt nobody," Dawson said. "If people are in the way, we make sure they know we are coming through. We warn them; we hit the horn and let them know we're coming through. You've got to watch people, and you gotta watch where you're going all the time." Mann Mullen, owner of the Big M, said the forklift drivers "are a key to the operation." The tobacco market is approaching rush time, which is between the first of September to the end of October. Mullen said prices on lugs, or the lowest leaves on the tobacco plant and the first sold, is between $1 and $1.25 per pound at his warehouse. "That's a little bit higher than last year," Mullen said. "The quality of the crop is better than last year."